This book is a fun way for your preschooler to learn the alphabet. The added rhyming paragraphs that accompany each letter combined with the wonderful full color illustration are a proven way to reinforce the learning experience. Colorful picture books are a great way to help your children learn while keeping them entertained as they flip through the alphabet from A to Z. This rhyming storybook is a perfect bedtime read to share with your children. Books for preschoolers that employ rhymes are more memorable. 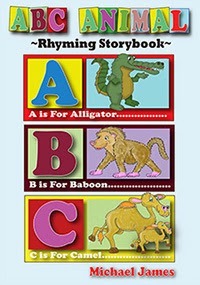 Each rhyme introduces your child to a whimsical animal and is guaranteed to put a smile on your child's face. The Illustrations are a way to imprint each letter on your childs mind. Here is a sample of the rhyme for the letter 'A'. 25 that follow that you soon won't forget. 'A' can stand for the green alligator. You won’t see many as a table waiter. To find the gator, look in the water. They prefer weather that is much hotter. Perfect for catching the big, fat trout.